Or as we like to call it, The Cream Tea. It’s been one of my favourite things about any day out ever since I was knee-high to a garden gnome. We were on holiday in Cornwall and took a boat trip up the Fal estuary which stopped at a place called Smugglers Cottage for the ubiquitous cream tea. I’ve no idea now whether it was actually a good one, but it started a life-long affair. Enough with the frivolity. This is a serious matter. 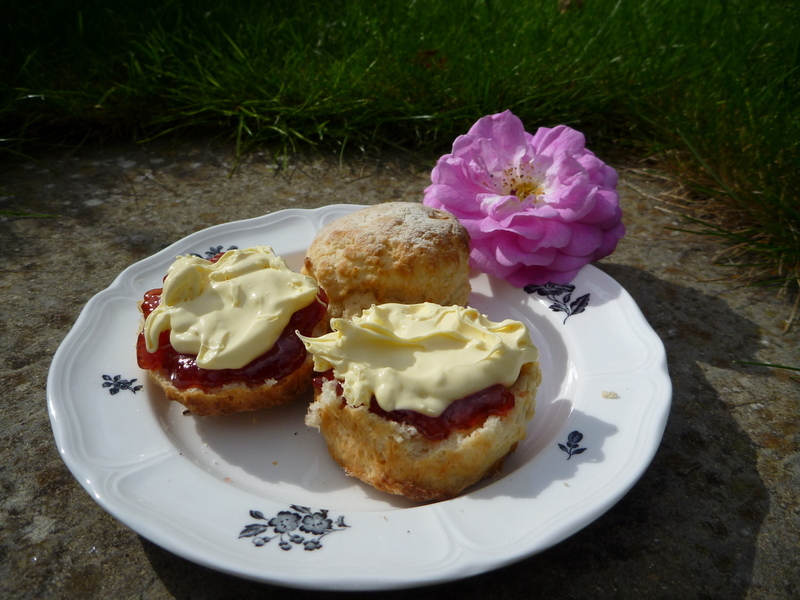 There are an awful lot of crap cream teas out there, and I vaguely imagine that thousands of foreign tourists return home from a holiday to Britain wondering what all the fuss is about, having had a dry scone with a niggardly portion of jam and vowed never to touch the stuff again. Whenever I stop for a cream tea and get given a measly thimble of jam and a shrew-sized scoop of cream I want to scream. 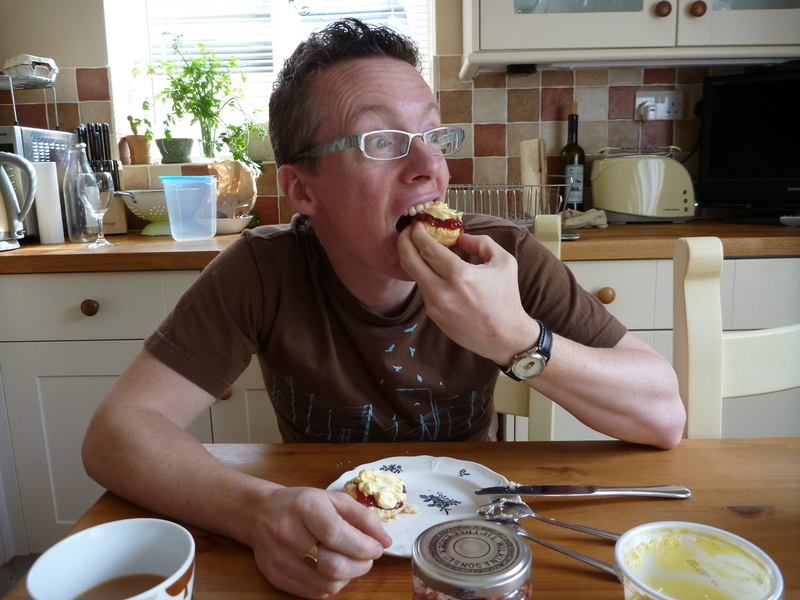 It’s jam, not bloody marmite! This is supposed to be a lusciously naughty snack and the crowning glory of a Nice Day Out, you penny-pinching, miserly, old harridan! Instead I feel like Oliver Twist when I have to go up to the counter with my thimble and beg “please Miss, can I have some more?” They don’t look horrified though, they just calmly charge 50p for another thimbleful. Is it so hard to follow three simple rules? Or four. Haha, can’t count. That’s all you need for a pleasant cream tea experience. Now, for the perfect cream tea you should be making buttermilk scones. And it should definitely be strawberry jam, fiddling around with other flavours is just not necessary. The cream should be clotted cream, of course. But to be honest the world won’t end if it is freshly whipped double cream. Your scones can have dried fruit in, I care not. Loose leaf tea is better, but a couple of bags in a pot makes a fine cuppa. Yesterday I baked scones for the first time ever. I had to think long and hard about this. Will I still think of a cream tea as the perfect end to a Nice Day Out if I can make them myself whenever I want? They are stupidly easy, after all. I think it’ll be okay though. I don’t have to tell you how to spread jam and clotted cream on, right? Study the photo! Oh, and eat them all within 24 hours, they don’t keep well even in a sealed container.